VALT 2016 Night 2 - Theme: VOLUME - "To hear, to be deafened, or to play with enormity or slightness." 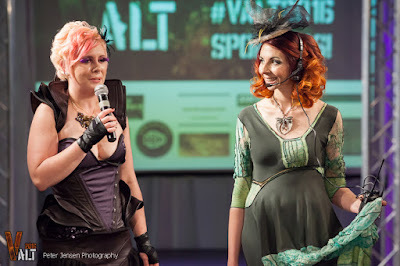 Day 2 of Vancouver Alternative Fashion Week (#VALT2016) started a bit crazy for me. Parking was seriously hard to find this day. I'm not sure why, but it took a long time to locate an open space. No worries, I had left home early, so was happily ensconced in my seat in time for the evening's shows. The theme tonight was VOLUME! In preparation I brought a pair of ear plugs just in case, but somehow didn't get them out of my purse in time. I quickly tucked my fingers in my ears until the next break, but felt this tap on my shoulder mid-show. There was co-founder Kat Ferneyhough with a pair in hand! That's the kind of personal touch that makes this event so special. Everyone involved always goes that extra mile. 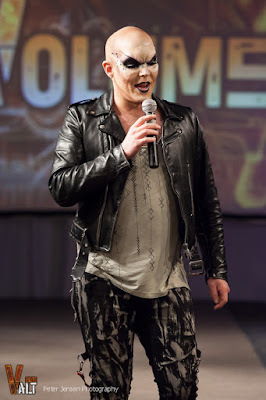 Our host for the evening's activities was Harrison Oswald - per his VALT bio a fire performer, club doorman, prop maker, costume maker and all round unicorn. His make-up was striking and he easily walked the runway in this incredible pair of heels. I was seriously impressed. Guests from all walks of life mingled and connected while enjoying the night's fashion shows, stage & musical performances, the art gallery and cash bar. One difference tonight from last night was that more members of the alternative scene came dressed to the nines. Turns out Sin City was holding an event that night as well. I loved it! Again - a picture is worth a thousand words, so I am going to again let the incredible images by Peter give you a window into the evening. Enjoy! Vancouver Alternative Arts & Fashion Week - VALT - #VALT2016 provides Vancouver's wildly explosive underground arts scene with a unique departure from typical arts affairs. 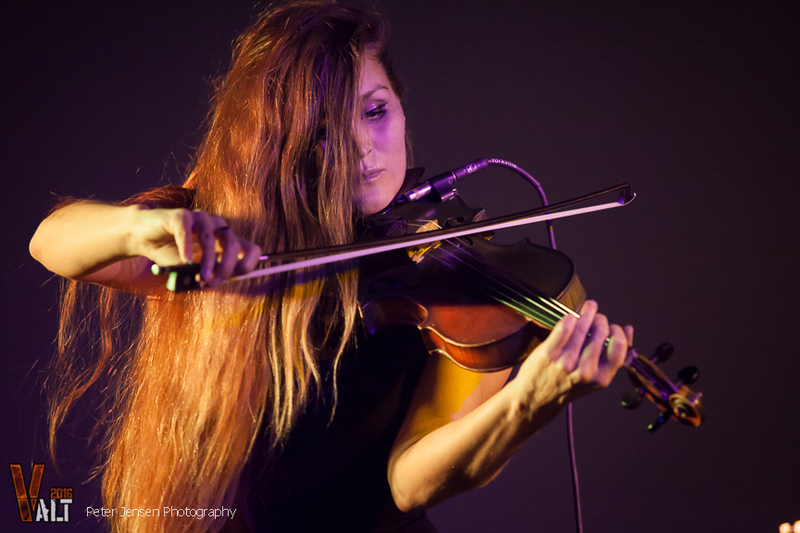 This three-day event boasts over 50 jury-selected artists, musicians, performers and designers, in a celebration and promotion of unbridled creativity. VALT encompasses wearable art, music (from solo musicians to full contemporary bands to electronic artists), drawing, painting, mixed-media works, sculpture, film (documentary, art film and narrative), performance art (from short theatrical works, to interpretive dance and beyond), photography and interactive installations.